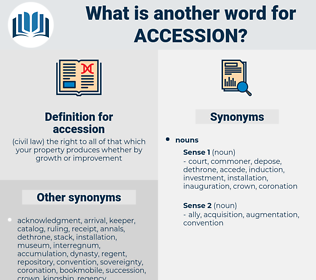 What is another word for accession? contestants, Persons, adopters, privileges, memberships, joining, Acceding, accede. assumption, joining, affiliation, Acceding, dedication, Adhering, attachment, allegiance, connection, devotion, arrival, reception, addition, rapprochement, Mainstreaming, introduction, ingress, compliance, support, signing, insertion. accepted, opened, subscribed, supported, concerned, signed, Adhered, agreed. decrease, repudiation, dispute, drop, deduction, disagreement, decline, subtraction, reduction, compression, shrinkage, loss, abridgment, fall. departure, ejection, withdrawal, dismissal, exclusion, egress, expulsion, refusal, removal, ouster, discharge, exit. The truth is that, in spite of the truce still existing, the English, since the accession of King John, had at several points resumed hostilities. Even this accession did not quite fill the latter. again, achaean, Ack-ack Gun, aegina, asinine, akin, axiom, acne, asana, acme, away game, acheson, assume, axone, acumen, achomawi, assign, ascoma, assignee, agama, akan, assuan, agism, aghan, Aken, awaken, aecium, assam, Assassin, asimina, assouan, agene, Agnomen, ashcan, axon, asin, ageism, aiken, aswan, achene, ask in, A. E. Housman, azymia, as was common, agone, Asama, asamiya, ash can, acousma, Agon, achaian, aachen, augean, agni, aegean, agony, awesome, asean, ashen, asian, agamemnon, aigina, auxin.